Denmark certainly appear to be the stronger side on paper, with Christian Eriksen unsurprisingly rated as the star man. 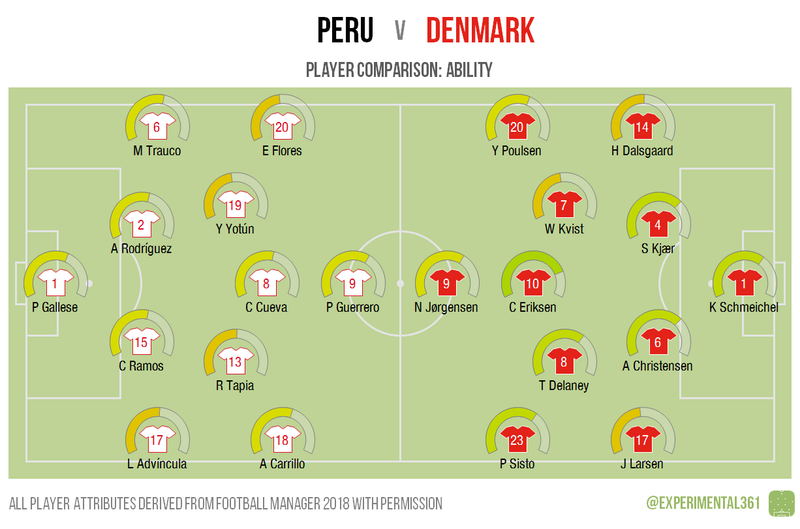 If the Danes have a weakness then it could be at full back, so if Carrillo and Larsen start as expected then the right flank could be a profitable avenue for Peru to exploit. This is an area in which the South Americans look to be at least the equal of their opponents. 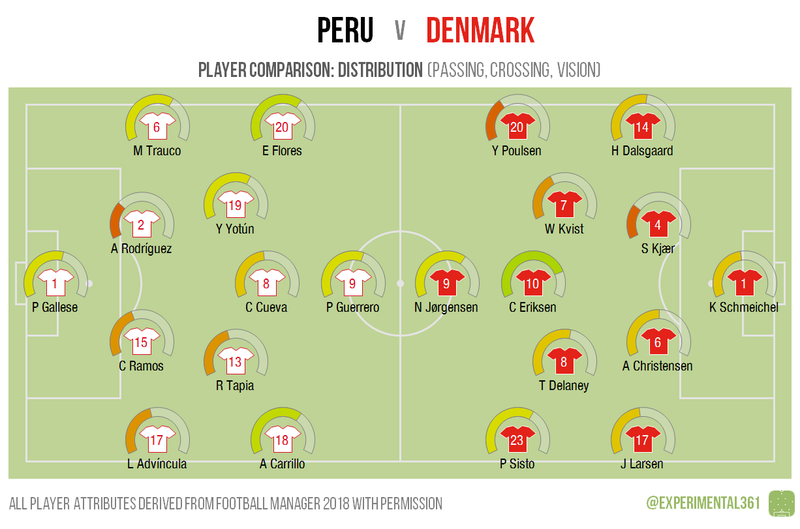 Neither team is overly-blessed with passers at the back, so with the exception of Trauco for Peru I wouldn’t expect to see the defenders heavily involved in trying to fashion chances. For Denmark, Eriksen is clearly the main man, while their opponents will probably look more to their wingers to create chances. I was surprised at how short Peru’s midfield is – the leftmost three in the likely five are all 5’7″ or shorter – so they may find find themselves short of useful bodies in corner and free kick situations at both ends of the pitch. 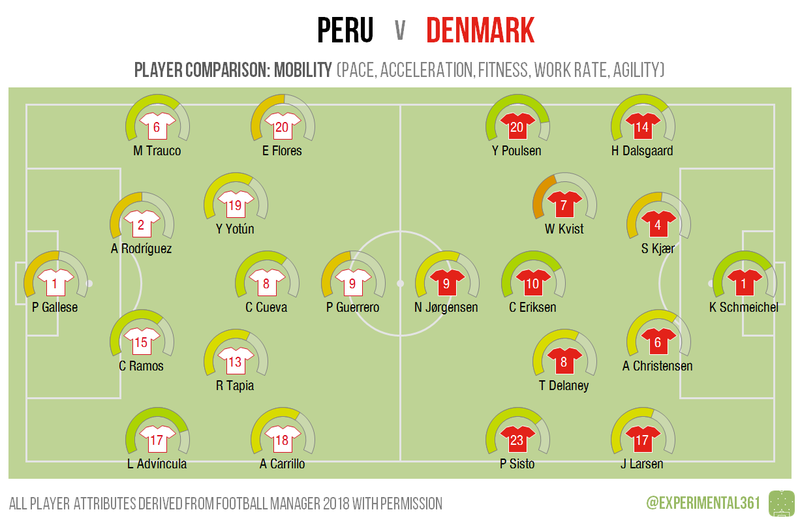 It looks as though the Peruvian full backs will be bombing up and down a fair bit, with Cueva in the middle also likely to be buzzing around. The three attacking midfielders in Denmark’s set-up can also stretch play, which will probably be necessary given the two more defensively-minded players sitting behind them.